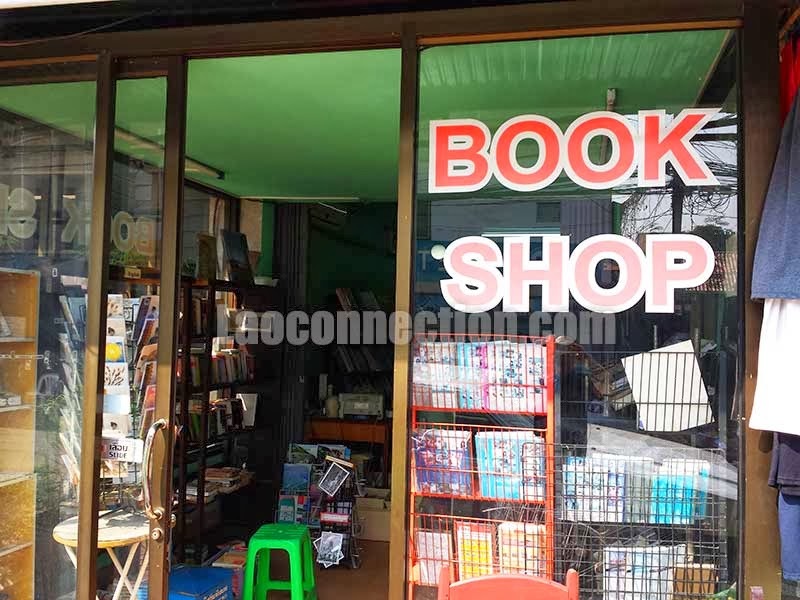 Although I visited 12 or 13 book sellers and book stores in Vientiane this past December 2013, these 2 following book stores are my favourites and have been around for what seems like ages. What I know for certain is that they've been around for at least 10 years because that's how long I've known them for. Admittedly, bookstores are rarely super busy in Laos. Often times I'd be the only one browsing for books or perhaps with just 1 or 2 other patrons doing the same. And usually you can have a friendly conversation with the owner or salesperson or other fellow bookworms looking to buy books. Tip: A nice conversation makes the negotiation later a lot easier when you're ready to buy. This first one was originally located on Pangkham Rd near Nampu and BCEL bank. His original sign years ago used to say Vientiane Book Center with the address stating Fa Ngum Rd. (even though in fact it's on Pangkham Rd.). 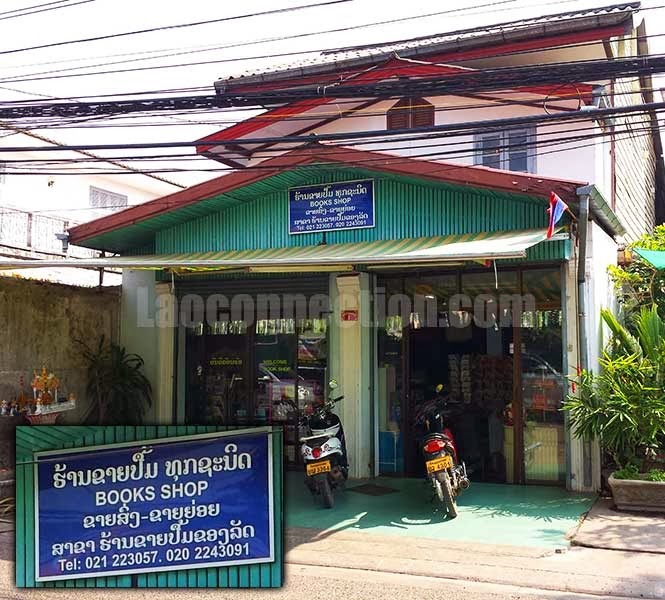 When searching online many websites still list this store as Vientiane Book Center on Fa Ngum Rd or Pangkam Rd., please note that is outdated info as there's no longer any book store at that location. I spoke with the owner and he told me that he moved to his current location within the last 3 years if I remember what he told me correctly. The current location is down a small road that intersects Fa Ngum Rd., perhaps 3 or 4 blocks from the old location. Sadly I didn't get the name of the little street. The sign on the front simply says "Bookshop" (see picture). Why my number #1 fave? Irrespective of the fact that it has a lack of a proper business name at the front of the store, the primary reasons why I like it most is because of the large variety of literature (books, manuscripts, research publications, bailan, journals, magazines, books, newspapers), old and new, and many rare and hard to find items, in mostly Lao and English. There's also the friendly owner who's quite enjoyable to talk to. Definitely must visit if you're going through Vientiane. Prices aren't cheap but it really depends on what item you're looking to buy. Some items are more better priced than others. I recall seeing items in the range from 20,000 kip to 130,000 kip and more. 10 years ago I recall buying a couple of English language books from him but this time I bought just one Lao photocopied book from 1974 called Baeb Hien Nat Seen (which I wrote a review on). I wanted to buy more but I was much more restrained on this trip when buying books (how good for me right?) and many items were a bit pricey. Thinking back to my recent visit though, I really do marvel at the variety of literature that he had. I could have spent hours browsing through everything in much more detail. On this particular visit, as I was browsing books near the entrance, I ran into a very well known author and professor of Lao history, an Australian, Grant Evans. He was busy talking to the owner in Lao when I was browsing books. Only thing is, I didn't who he was until after he left. The book store owner explained who he was when I inquired that he was so fluent in Lao for a falang. As someone who has read several of his books, I can't deny I was enthralled by the semi-celebrity sighting. I only wish I had the opportunity to speak to him. In my mind I always just called her the Book Lady as I didn't really know her name. But according to her business sign it's Tuksanit Bookstore (see picture). She too is located along a small street that intersects Fa Ngum Rd. Again I never did get the name of the street but if you drive along Fa Ngum Rd (or as it's known locally, kaem kong), you'll see small signs pointing you to a bookstore. There's only a couple of signs from 2 different streets indicating a book store is in this direction. I suggested to her that she should have more advertisement or signs and she replied that yes there was a sign out on the main road. Mind you it's a small sign with Lao writing written on a piece of wood. So I knew what she was talking about but I doubt many others would have noticed. In any case, this bookstore is essentially in her home (like many businesses in Laos). It has overtaken her main floor which used to be the living room as I recall from 10 years ago. She too is a friendly book store owner and enjoyable to talk to. I had a wonderful time recounting to her that 10 years earlier I had come to buy books from her. And that at the time her son who opened the door tried to abruptly turn me away at the door because. I believe he thought that I was some government taxman. It was all very funny as I wouldn't relent to leave and essentially demanded that he go get his mother since in fact she was that one who told me to visit at the house to check out books. I don't think she remembered me but I think she was impressed and perhaps flattered that I still remembered the details of our last meeting from a decade ago. I still remember what I bought back then too! It was the Treasures of Laos book for 500,000 kip (roughly $50USD back then). I thought it was expensive at the time but I couldn't deny it was a gorgeous book. It had limited printing and was full of old photos and engravings of Laos that I had never seen before so how could I not buy it? She wouldn't budge on the price then. She has a large variety of books similar to the first bookstore I described including other knick knacks and postcards. Items are mostly in Lao and English. It's definitely worth visiting as well. Regarding pricing: Prices are good and about on par with the first book store mentioned. Again it depends on what you're looking to buy. For those who might be interested to know, on this trip to her book store I did buy a couple of books.